The other day, I ended up with two big cauliflower heads in my fridge. I simply forgot that I hadn't used the first one when I bought the other. As they take up quite a bit of fridge space, I decided to use one immediately and make a soup out it. Knowing that my husband is not the biggest fan of cauliflower, but a lover of soup, I decided to contrast the mild and sweetish taste of cauliflower with some tart spinach. 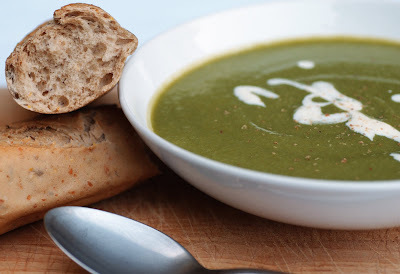 It worked really well, although there is the risk that the spinach takes over the whole soup. You can play around with the measures of cauliflower and spinach and put it in the soup according to your taste. The measures given below worked well for us, giving both vegetables a chance to bring out their flavor in the soup. Over medium heat fry onions in olive oil until soft, for about 5 minutes. Add spinach with plenty of salt and pepper. Turn up the heat. Cook the spinach until it wilts, keep stirring. Add the cauliflower florets and vegetable stock. Bring to boil, lower the heat, cover the pot, and simmer the soup for 15 minutes or until tender. Season with nutmeg, salt and pepper, to taste. If the soup seems too thick, add water, a few spoons at a time, to thin it. Garnish with a spoonful of plain yogurt or creme fraiche.